Brian Urlacher will be inactive as he recovers from knee surgery this week. 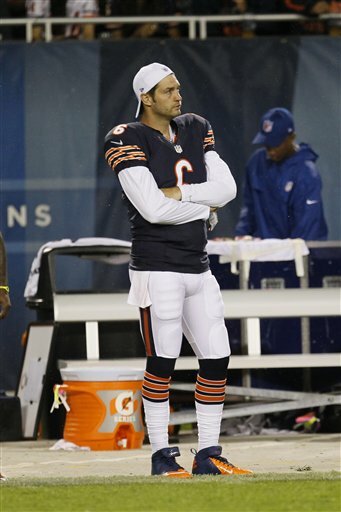 Jay Cutler watched from the sidelines during last week's game. 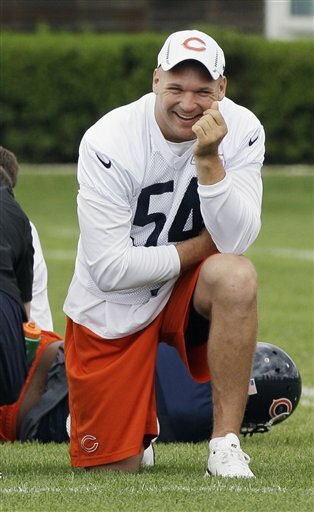 Friday the Chicago Bears leave Bourbonnais, head north and continue pre-season training in Lake Forest, Ill. They hope to have a better showing in game two of the pre-season, against the Washington Redskins Saturday night at Soldier Field. But Bears fans shouldn&apos;t get so dramatic about last week’s loss (or wait — they can’t help themselves). So let&apos;s be clear: It’s the pre-season; losses don&apos;t matter. Let&apos;s talk about what does matter. Brian Urlacher&apos;s knee saga has fans and the media going nuts. The arthroscopic surgery he had Tuesday was apparently to clean out some debris. If that&apos;s the case, the expectation is Urlacher should be ready by 2012 season opener. If not, there will be plenty of worried people at Bears headquarters in Lake Forest. That reaction should probably be tempered until at least the season opener. Yesterday Brian met the media and said he has the opener targeted for his return. As to the set back, "It has taken longer then I wanted," said Urlacher. "It is frustrating after seven months; you&apos;d think you would be healthy by now." If the 34-year-old All-Pro linebacker can&apos;t line up at the September 9th season opener against Indy or in game two in Green Bay just four days later, that&apos;s when we should ramp up the second guessing. In 2004, Urlacher missed seven games due to an injury and in 2009 he suffered a season-ending injury — in the season opener. The Bears struggled both years and didn’t make the playoffs. This year there have been red flags about the injured linebacker since he didn&apos;t participate in mini camps, OTA’s and most of the training camps. But it&apos;s amazing that at his age and at this point in his career that Urlacher does still have impact on the team&apos;s defense and on the team as a whole. One has to wonder, though, how much time Urlacher has left. It almost seems sacrilegious to say, but the Bears have to start planning for the day when they won&apos;t have Urlacher on the field. The Bears defense has many top notch talents in that unit: Lance Briggs, Julius Pepper and Charles Tillman. But #54 has been the anchor for 12 years. For now, veteran Nick Roach will man the middle linebacker spot until Urlacher returns. Free-agent signee Geno Hayes from Tampa Bay will handle the strong side linebacker spot. Jay Cutler watched from the sidelines last week, only hours after becoming a father. Cutler will start Saturday and Coach Lovie Smith will have the starting QB handle more plays, since he did not see action against Denver. There is no doubt that Cutler, Smith and offensive coordinator Mike Tice have some real concerns about keeping the Bears quarterback healthy. The cause for the worry is at left tackle and the culprit is J’Marcus Webb. To say it rather honestly, he stunk last week, plain and simple. In fact, he was so bad that Tice said he has lost sleep worrying about protecting Cutler. When Cutler was told about Tice’s lack of sleep, he laughed and said he isn’t getting any, but it wasn’t because of football — it’s a newborn keeping him up. It will not be a laughing matter if the Bears don’t have a solution to that key problem with the offensive line. Webb has had better practices this week and he knows that Chris Williams is getting reps and will be used as a replacement. The second pre-season game will start separating the haves and the have nots. Whoever makes plays will give them an edge to make this team. The competition at receiver has ramped up. Dane Sanzenbacher was last year’s nice story of a free agent; he is in a battle to make the team with rookie Chris Summers. Needless to say, the Bears want to see more with their draft picks; they liked what they saw in Shea McClellin, Alshon Jeffery, Evan Rodriquez and Brian Harden, but they still have miles to go to be ready for the season. The practices have become a little chippy, with cornerback Tim Jennings mixing it up with the Bears receivers. As the camp winds down and the season opener gets closer, players start sensing they need to show the coaching staff more to cement jobs — or take one.